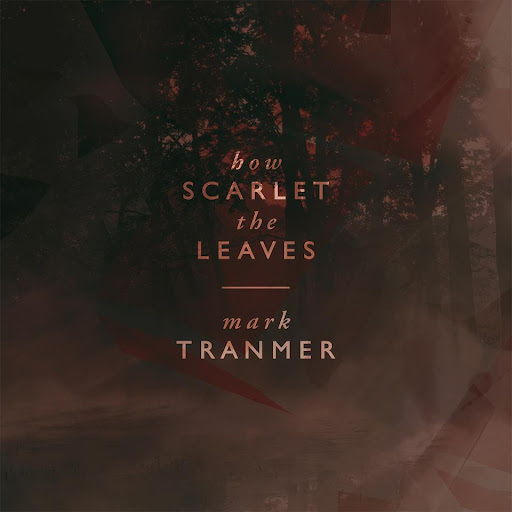 Mark Tranmer * How Scarlet The Leaves * VF007SE * Special edition. 1. A 12" clear vinyl record of "How Scarlet The Leaves" in a spined sleeve. 3. An extra album VF007X - 8 tracks: 6 rare/unreleased Mark Tranmer/GNAC songs/versions + two remastered album tracks from "Scoop of Ice...-Cream Moon". 4. A signed postcard of somewhere in the Calder Valley, West Yorkshire, UK, or somewhere I have recently visited. 'Biscuit Barrel Fashion' is wholly instrumental so lovelorn Durutti Column type-ballads give way to bizarre, nostalgic trips into murder mystery-type incidental music. Alessandra is playing live in London on 17th, 19th and 20th November at the Eighth Planet Tree Music Festival. Details. "Bad Dancers Collide" is a collaboration between singer-songwriter Beth Carley and Mark Tranmer (who also works with gnac and The Montgolfier Brothers). The duo are currently working on a collection of songs for release soon, and are rehearsing for future gigs. 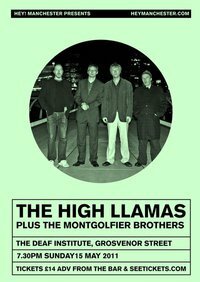 We’re exciting to announce a rare Manchester visit by Sean O’Hagan’s The High Llamas – plus an equally rare appearance by the Montgolfier Brothers! Tickets are available from the bar, Common (both no booking fee), Piccadilly Records, Seetickets.com, WeGotTickets.com and on 0871 220 0260. Although the High Llamas are nominally a group, they’re pretty much the brainchild of singer and guitarist Sean O’Hagan. O’Hagan did some time in the London-by-way-of-Dublin band Microdisney, in which he was the songwriting partner of Cathal Coughlan. After Microdisney split in 1988 (Coughlan forming Fatima Mansions), O’Hagan released a couple of import-only solo albums before forming the High Llamas. The Llamas issued their debut, Gideon Gaye, in 1994 to high praise in the British press; it was released in the States a year later almost as an afterthought, with virtually no fanfare. Comparisons of the High Llamas/O’Hagan to Brian Wilson/the Beach Boys are unavoidable, and not just from arcane critics. Anyone with a large Beach Boys collection will detect the uncanny resemblance to 1966-1970 Beach Boys, with the sophisticated melodies, the beautiful harmonies, and the elaborate production, with the emphasis on layered keyboards and orchestration. Echoes of Pet Sounds, Smile, Wild Honey, and Surf’s Up predominate, though O’Hagan also claims Burt Bacharach as a major inspiration. The Llamas began to build a bigger and bigger fan base throughout the late 1990s (in the US as well as the UK) and O’Hagan’s ever-shifting, ever-growing stable of side musicians made sure every album was as beautifully arranged and carefully conceived as the last. Subsequent efforts include 1996′s gorgeously sprawling Hawaii, 1997′s warmly clinical Cold and Bouncy, and 1999′s chilly Snowbug. Buzzle Bee arrived the following year, featuring a more stripped-down sound and guest vocals from Mary Hansen from Stereolab. 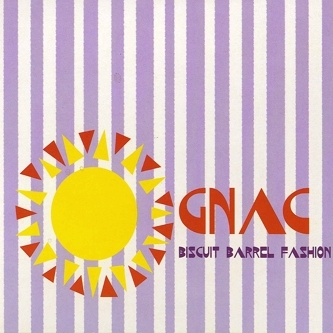 Before her tragic death in late 2002, O’Hagan had Hansen onboard for the Llamas’ chamber-pop masterpiece Beet, Maize & Corn. Virtually eliminating the standard ‘electric guitar, bass and drums’ formula, Beet, Maize & Corn was full of lilting strings, warm horns and gently plucked classical guitars, and proved to be a high achievement for the Llamas with both critics and fans. Four years later, in 2007, O’Hagan and company revisited the sunny sprawl of Hawaii (as well as Cold and Bouncy’s technical slickness) for the upbeat and lovingly crafted Can Cladders. Along the way the band provided music for the 2000 feature Sunburn, while O’Hagan frequently arranged and produced work for the likes of Doves, Super Furry Animals and Sondre Lerche, and percussionist Allum has worked with Turin Brakes and the Lightning Seeds.The High Llamas’ first new album in first years is due out on Drag City in April this year. We’re excited to have the Montgolfier Brothers supporting. The trio, who are one of our favourite Manchester bands, will make an extremely rare live appearance – their first here in two years. 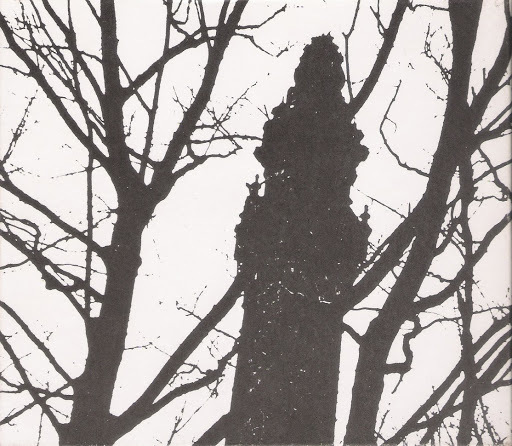 Since 1997, Roger Quigley (aka At Swim Two Birds), Mark Tranmer (Gnac) and Otto Smart (The Otto Show) have released their own recordings as well as three Montgolfier Brothers albums: Seventeen Stars, The World Is Flat, and All My Bad Thoughts. In 1999 Alan McGee signed them to his Poptones label and has since said of them, ‘sometimes the best bands feel like a well-kept secret’. It’s true. 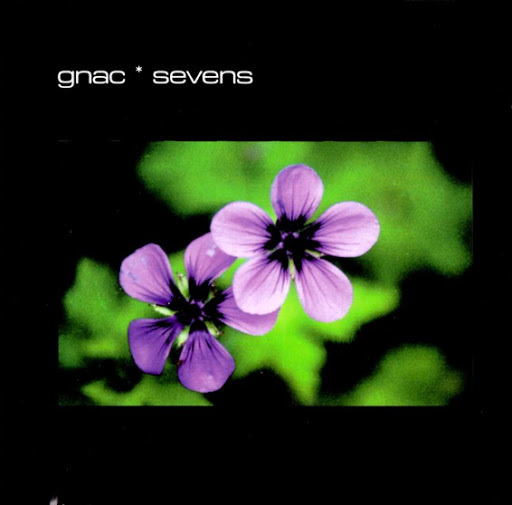 'Sevens' is a handy round-up of Mark Tranmer's early singles and compilation appearances under the guise of Gnac. So this is an ideal introduction to Tranmer's quintessentially British sound which evokes bored Sunday afternoons whilst marooned in an early 60's kitchen sink melodrama. 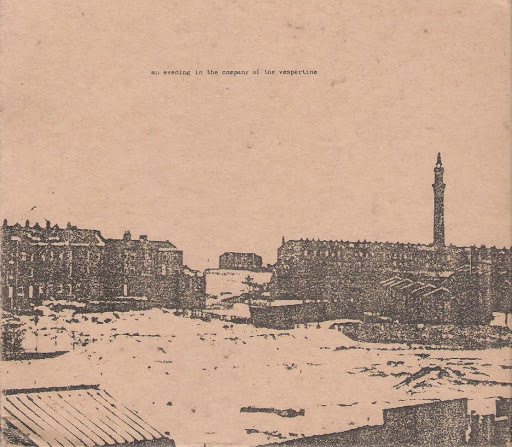 1- V/A "An Evening In The Company Of Vespertine", Compilation 1997. Against The Tide. 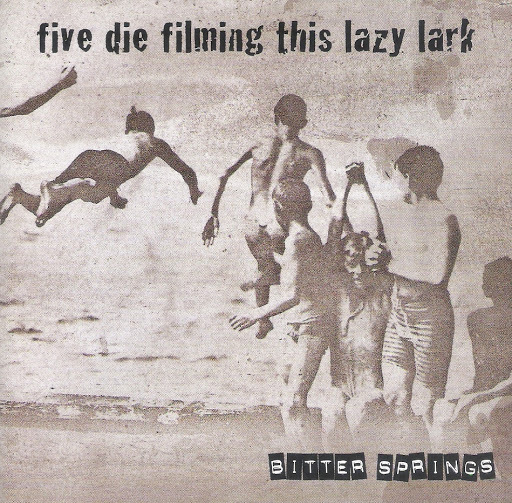 2- The Bitter Springs "Five Die Filming This Lazy Lark" 1999. 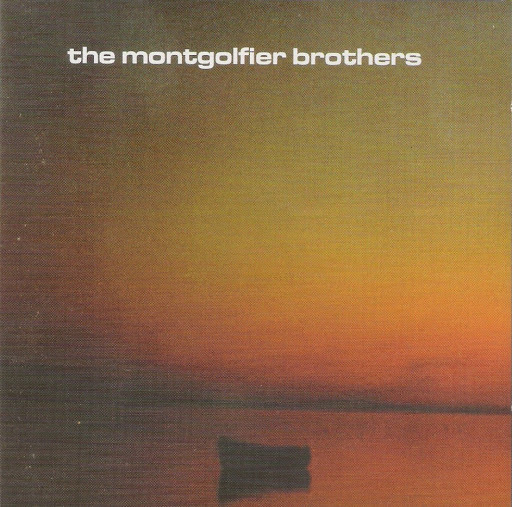 3- The Montgolfier Brothers "Seventeen Stars" 1999. 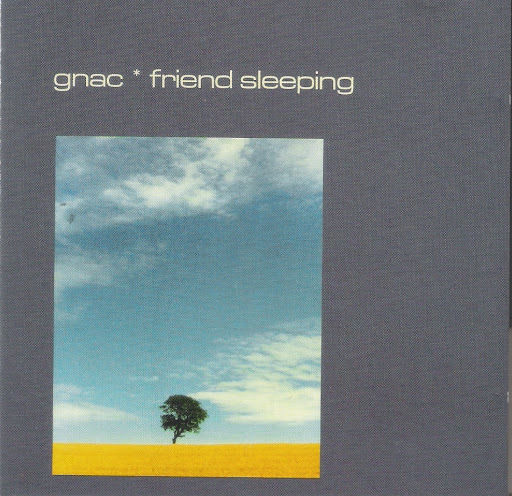 4- Gnac "Friend Sleeping" 1999. 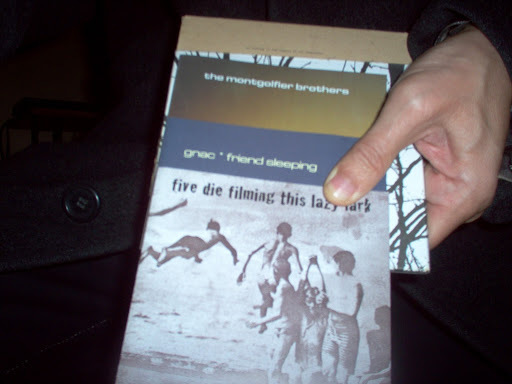 5- V/A "A Murder In The Company Of Vespertine" 2000. Vespertine closed doors in 2000 and returned as Vespertine & Son in 2001 with At Swim Two Birds "Quigley's Point".